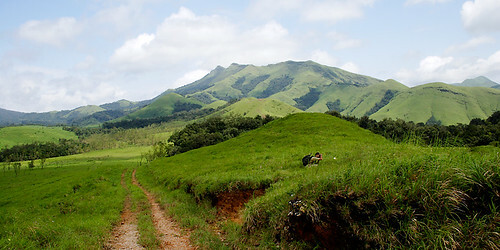 Kudremukh Peak is the one of the highest peak in Karnataka and highest in the Kudremukh national park also known as Kudremukha National park. This peak lies about 1892 meters or 6214 feet above sea level. ‘Audre’ means horse while ‘mukha’ means face. As the name suggests, it looks like a horse face hence called Kudremukh or kudremukha. This peak lies in the forests of Kudremukh National park. 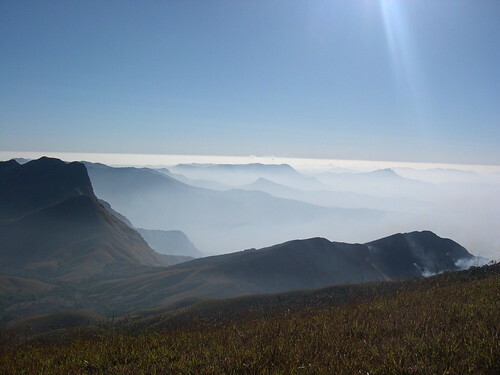 Kudremukh peak trek lies on the popular trekking trails in the national park. Tickets are to be taken from the forest department before entering the park and follow the guidelines set by them. Kudremukh national park amidst Western Ghats has a very rich biodiversity and home to certain species of wildlife which is no where else found on this planet. Nearest Airport: Mangalore(60 kms) is the nearest airport to this place. Bangalore is the nearest international airport having connecting flights from most parts of India. 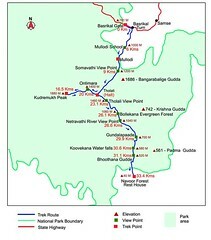 Bangalore is about 351 kms from Kudremukh. Nearest Railway station: Mangalore or Udipi is the nearest big railway station. Both lie on the scenic route of Konkan railway. How to reach Beltangady: To reach Beltangady or Beltangadi or Belthangady from Bangalore, one has to take national highway 48 or NH 48, which passes through Hassan. After Uppinangadi, a 18 km diversion from the NH 48 towards NH 13 would lead you to Beltangady. Alternate route is from Golitattu on NH 48 one may take route to Dharmastala and then to Beltangady. To reach Beltangady from Mangalore, one can take NH 48 till Panemangaluru and then NH 13 to Beltangady. Note: This region has leeches in plenty and so you may carry salt or tobacco powder to remove leeches. Navoor is on Beltangady-Killoor road. Jamalagad can be seen on left along this route. Tickets to enter the park may be obtained here. After Navoor foot trail starts and most of the climb is in North north west direction on eastern side of hill range and valley on right.Tolali lies somewhere between Hiremar Guppa peak and Kudremukh peak. Lobomane or “Lobo’s house” was a house made by Simon Lobo, a priest who made the Kudremukh ranges his home. After Simon Lobo had passed away, Lobomane is under a caretaker called Shankar. Lodging accommodation can be obtained here. Food is can also be made available on request. Grave of Simon Lobo is located just ahead of Lobomane. From Lobomane about 3-4hours of trek lead you to the summit. One may come back to Lobomane and camp. This route passes through shola (montane) forests near the top. About 30 minutes below summit is a ruined church and a small waterfall. Birds are found in abundance and is paradise for bird lovers. Around 6-8 kms walk from Lobomane leads you to Mullodi. Further 6 kms would lead to Basrikal gate. Road is motorable after Mullodi. One has to reach Malleswara and then to Samse to catch vehicle further. Alternatively, if one has vehicle left at Navoor, then on day three, one can trek back towards Navoor and trek to Jamala or Jamalabad fort or Jamalghad kote, situated at around 1700mts from sea level, supposedly built by Tipu Sultan near Navoor. However camping is not allowed here.